Biology works at nanoscale, with objects invisible to the human eye. With BioBlender it is possible to show some of the characters that populate our cells, based on scientific data and the highest standard of 3D manipulation. Scientists all over the world study proteins at atomic level and deposit information in the public repository Protein Data Bank, where each molecule is described as the list of its atoms and their 3D coordinates. With BioBlender users can handle proteins in the 3D space, displaying their surface in a photorealistic way, and elaborate protein movements on the basis of known conformations. PDB files can be loaded from a user-defined directory or downloaded directly from the PDB site (by inserting the PDB code). The protein is displayed in 3D (as atoms or molecular surface) and the user can calculate and visualize its surface properties, Molecular Lipophilic Potential and Electrostatic Potential. 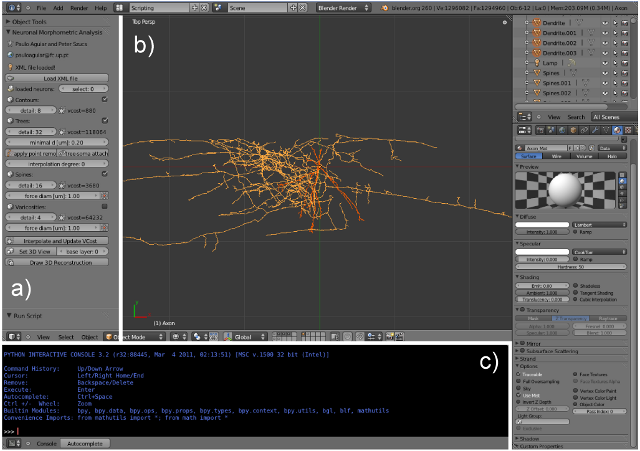 For protein motion, BioBlender calculates intermediates between two conformations using Blender Game Engine. The program gives as output both the intermediate PDB files and the rendered images as a movie. BioBlender is an implementation of Blender, an open source, freely distributed, multiplatform, interoperable and supported program of 3D animation, visual effects and video games. The combination of 3D computer graphics, game engine and scientific programs, make of BioBlender a complete instrument to elaborate the movement of proteins and to display their surface features using a visual code based on texturing and particles special effects. In this way it is possible to show the physical and chemical properties of a molecule in motion. MORSE is an generic simulator for academic robotics. It focuses on realistic 3D simulation of small to large environments, indoor or outdoor, with one to tenths of autonomous robots. MORSE can be entirely controlled from the command-line. Simulation scenes are generated from simple Python scripts. MORSE comes with a set of standard sensors (cameras, laser scanner, GPS, odometry,…), actuators (speed controllers, high-level waypoints controllers, generic joint controllers) and robotic bases (quadrotors, ATRV, Pioneer3DX, generic 4 wheel vehicle, PR2,…). New ones can easily be added. MORSE rendering is based on the Blender Game Engine. The OpenGL-based Game Engine supports shaders, provides advanced lightning options, supports multi-texturing, and use the state-of-the-art Bullet library for physics simulation.